Have you ever noticed that wine glasses are NOT a standard size or shape? Is there a reason for this – and is it just about the way they look or does the shape of a wine glass actually affect the flavour of the wine? The base – this part is needed to keep the wine glass standing! The stem – this is the part you hold which connects the base and the bowl. The bowl – this is the part that holds the wine. When filling a wine glass, always aim to fill the glass around one third, or to where the bowl is at its widest to maximise the wine’s contact with the air. You need enough space left in the glass to collect those vital aromas! Essentially, although all of the above parts may vary, it’s the size and shape of the bowl that makes all the difference. Smell is crucially important in how we appreciate wine. Our nasal passages can detect many thousands of different flavours and this is why a wine’s nose is a critical part of our perception. If the aromas have dissipated, the taste of the wine loses much of its intensity. Fresh and zesty white wines suit glasses with smaller bowls to concentrate the delicate aromas, while full-bodied wines need a larger bowl to allow the more complex aromas to shine through. RIEDEL are one of the most well known wine glass designers (they created the “Montrachet” glass, which better emphasises a creamy texture because of the wider mouth) and they have acquired some scientific explanations as to why the shape of a glass influences the bouquet and taste of alcoholic beverages. “The first discovery was made while enjoying wine. The same wine displayed completely differently characteristics when served in a variety of glasses. The differences were so great that experienced connoisseurs were made to believe that they were tasting different wines”. RIEDEL were then able to create glass shapes in which the wine, vinified from specific grape varieties, seemed to improve! The main obvious difference you may have noticed (aside from the slim flute of a champagne glass!) is between red and white wine glasses. The bowls of white wine glasses tend to be smaller in shape because the aromas are lighter – they can also maintain a cooler temperature and preserve floral aromas. However, different types of red and white wine still have their own glasses. Pinot Noir glasses for example, have a large bowl that is one of the widest of any wine glass while Syrah or Shiraz glasses are smaller than most red wine glasses. The choice of which red wine glass to use is all to do with mitigating the bitterness of tannin or spicy flavours to deliver a smoother tasting wine. A standard wine glass is perfect for medium to full-bodied red wines, with spicy notes and/or high alcohol. Depending on what you drink the most, you may also want to invest in some speciality wine glasses such as Port glasses, which have a small size and narrow mouth to reduce evaporation (as it’s a high alcohol wine). Finally – what the wine glass is made of also matters! Leaded or lead-free crystal is the best, giving a sparkle and an elegant feel. The glass should however not be frosted or coloured and you should clearly be able to see the wine through the glass inside. A contradiction in terms “ a warming winter white ” may be, except I don’t know about you, but I’ve had it with Sauvignon Blanc. Maybe it’s the time of year, the chill in the air or the change of menu. It’s just not cutting it for me. It could it be boredom with the linear taste profile; the firm acidity or the gooseberry tartness but there is just nothing that appeals in the flavour anymore. Most of us love wine and cheese at the end of a meal and for those who do not have a palate equipped for desserts, can be a welcome end to a dinner party rather than something sticky and cloyingly sweet. The big question is – what wine should we drink with which type of cheese and are there any guidelines to pairing the two together? Have you ever found yourself overwhelmed by the choice of wines on a restaurant’s wine list, or struggled to pick a bottle off the shelf to have with your dinner? Would you like to be able to choose wines with more confidence? 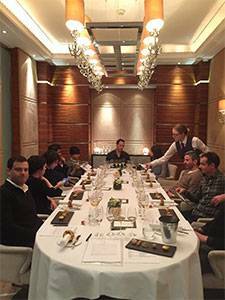 – Then our Gourmet Wine & Food Matching Masterclass is the event for you. Delicious, desirable and delicate,no wonder rose wine is having its moment in the sun. Coolly fashionable with celebratory endorsements from Sir Cliff via Mick Hucknall (Simply Red-Simply Rose doesn’t have the same cachet) to Brangelina it’s making a splash from pool sides and patios across the country. Peak consumption has always been across the summer months and that has not changed. However as the nights grow colder, rose could also be a perfect match for richer autumn dishes. Perhaps it is nostalgia for the eighties (remember Mateus Rose and its distinctive bottle) Or perhaps it’s the arrival of more sophisticated tipples such as Provencal Rose, reminiscent of holidays in southern France. It could be the awareness of dryer styles, some of which can easily withstand the overzealous barbeque chef producing a little more char than was bargained for. Rose is made wherever red grape varieties such as Pinot Noir, Grenache, Cabernet and Tempranillo are grown. The marked colour differences depend upon how long the grape juice remains in the same vessel as the red grape skins. A shorter contact time results in a paler more delicate colour. It is a myth that all rose’s are sweet but with current labelling it’s often difficult to tell the difference. A useful guide is to look at the alcohol content. Wines between 12% and 14% will tend to be dry as more of the grape’s natural sugars have been converted into alcohol. Whereas wines around 10% will tend to be fruit bombs generally made from the Zinfandel grape. Our guess though is that it’s a crowd pleaser and a good compromise when one of you fancies white wine and the other red. Why not agree on a refined, elegant Sancerre Rose or even a delicious, versatile Rioja Rose. Perfect with red or white meat, vegetarian dishes or even fish!